Throwing Shade Theatre Co. in association with EMU productions presents, DOWN AN ALLEY FILLED WITH CATS, by Warwick Moss, at the King St Theatre, Newtown. 25 April - 13 May. DOWN AN ALLEY FILLED WITH CATS, is an Australian play written in 1987, by Warwick Moss. It is a two handed small-time conman comedy-thriller. Timothy Timmony, a Polish refugee second-hand book seller matches wits with a petty Aussie 'crook', Simon Matthews, in search of a 12th Century Sung Dynasty vase treasure (The Maltese Falcon?!) worth an estimated 'half-a-million'. Two contrasting characters from two different worlds locked in the same space, over night, apply their wiles amusingly, intriguingly in classic Agatha Christie style tension: "Who's telling the truth?" "Are they who they say they are?" "Who's doing what now?" and "Who do I believe?" 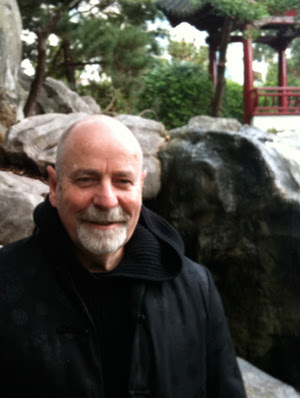 As the Director, Tom Richards, says in his program notes: 'We quickly learn to expect the unexpected!' That's the fun of this light entertainment and although it doesn't have the theatrical (disguise) surprises (or budget demands) of a play like Anthony Shaffer's 1970 comic thriller, SLEUTH, it certainly reminds one of it. 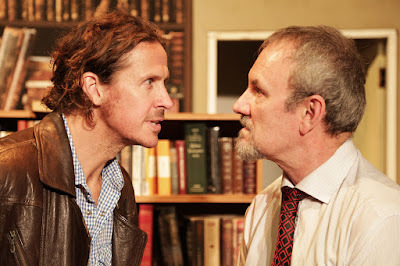 On a depressingly realistic set, that does look like many a second-hand bookstore in the local neighbourhood, on King St, Gabriel Egan (Simon) and William Jordan (Timothy), play it out with, as yet, a nervous bravado. Still finding their way with the text and audience, the performances should grow in confidence as the run progresses. Both these actors make the characters a winning personality - audience allegiance can switch from one to the other with ease, and one begins to 'invent' the solution to each of the plots twists for them - it is kind of fun. I had never seen the play before, or read it, and am delighted to have caught it. It has a surprising confidence in plotting and a deft hand at characterisation and comedy-suspense. Along with Ron Blair's PRESIDENT WILSON IN PARIS, it represents a genre of Australian playwriting that is rarely seen or appreciated.